Temperature : Max. 41°C and Min. 28°C in Summer. Max. 23°C and Min. 5°C in Winter. Rainfall : 26 cms. to 44 cms. Clothing : Light Tropical in Summer. Woollen in Winter. The royal fortified city with a timeless appeal. Lying in the north of the desert state, the city is dotted with many sand dunes. The strategic location of Bikaner on the ancient caravan routes, which came from west/central Asia, made it a prime trade centre in the times of the yore. The town is renowned for the best riding camels in the world. The magnificent fort and palaces, created with delicacy in reddish-pink sand stone, bear testimony to its rich historical and architectural legacy. Undulating lanes, colourful markets and bright and cheerful folks make Bikaner an interesting experience. The town is also famous for Rashgullas, Bhujias and papar, which are popular through out the country. Air: Nearest airport is Jodhpur 253 km. Rail: Bikaner is well connected by trains with all major cities of India. 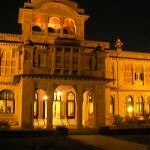 Road: Bikaner is well connected by roads with cities of India as well as state. Local Transport: Unmetered taxis, auto-rickshaws and tongas. Lalgarh Palace: This palace was built by Maharaja Ganga Singh in commemoration of his father Maharaja Lal Singh. This is an architectural masterpiece in red sand stone has beautiful latticework and filigree work. Sprawling lawns with blooming Bougainvillea and dancing peacocks make it a not-to-be missed visual treat. Part of the palace has been converted into a luxury hotel and a museum. 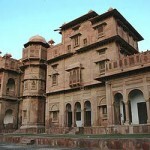 Junagarh Fort: The fort was built by Raja Rai Singh in 1593 A.D. It is a formidable structure encircled by a moat and has some beautiful palaces within. Ganga Golden Museum: This is the best Rajasthan museum, having one of the richest collections of Terracotta ware, weapons, miniature paintings of Bikaner school and coins. The exhibits splendid masterpieces of Harappan civilizations, Gupta and Kushan era and sculptures of the late classical time. The museum has a separate section displaying exclusive arts and crafts of the region. The museum is open daily from 10 hours to 16:30 hours except on Friday. Entry fee is required. 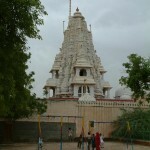 Bhandasar Jain Temple: This temple is situated 5 km from Bikaner. This beautiful Jain temple of 16th century A.D. dedicated to 23rd Trithankra, Parsavanathji. Ship Bari Temple:This temple is situated 6 km from Bikaner, built in the late 19th century. The temple is surrounded by an embattlement wall. It has beautiful paintings, and a bronze Nandi facing the Shiva Lingam. Devi Kund: Situated 8 km away from Bikaner in Rajasthan. A royal crematorium is several ornamented cenotaphs built in the memory of the Bika Dynasty rulers. The most impressive cenotaph of all is created entirely in white marvel with spectacular paintings. Camel Research Farm: This farm is situated 8 km from Bikaner. Spend a day with the indispensable ship of the desert at their camel research and bleeding centre – one of its kinds in Asia. The farm extends over 2000 acres of semi arid land. 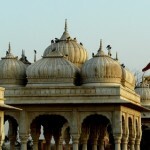 This entry was posted in Bikaner, Rajasthan and tagged Bhandasar Jain Temple, bikaner city, bikaner fort, bikaner maps, bikaner palace, bikaner photos, bikaner temperature, bikaner tour, bikaner tourism, bikaner tours, Camel Research Farm, Devi Kund, Ganga Golden Museum, Junagarh Fort, Lalgarh Palace, Shiv Bari Temple, temperature in bikaner. Bookmark the permalink.